I don't know how many people still read MSDN Magazine, but over the past several months I've used my monthly column (called "UI Frontiers") to put together a rather substantial Windows Phone program that lets you search, download, and read free plain-text e-books from Project Gutenberg, the repository of over 30,000 public-domain books. 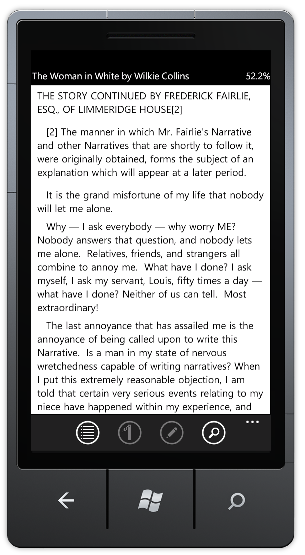 I didn't really intend to write an e-book reader. The whole thing started in the May 2011 issue when I explored printing support in Silverlight 4. Then in June I did some text pagination for the printer, but also for the phone using the Gutenberg text of Jane Austen's novel Emma. In July I got into transitioning between the pages of a book with George Eliot's Middlemarch, and in August I showed some tricks to get font metric information for fast text layout using Anthony Trollope's Phineas Finn. The September column went into text-selection with Charles Dicken's Bleak House, October was all about the Windows Phone equivalent of dialog boxes (with four classsics of horror literature), and the November column finally got to to a point where you can read books that you chose! Of course, every column comes with its own batch of downloadable source code. The biggest drawback of Phree Book Reader is that it only works with plain-text files. I preferred at the time to focus on issues other than the complexities of advanced e-book standards, but I soon realized that plain-text has its own complexities — such as figuring out the chapter breaks, and differentiating verse from prose. At this point, I'm intrigued enough with e-book readers for portable devices that I'm tempted to delve into something a bit more challenging.